Le Triangle d’or indien est extrêmement populaire parmi les voyageurs car il relie certains des meilleurs sites touristiques de Delhi, Agra et Jaipur, mais il peut être difficile de suivre la route si vous n’avez pas de moyen de transport. 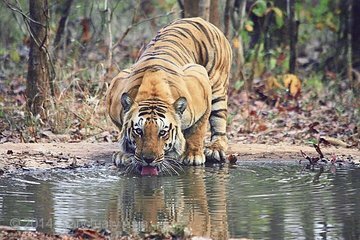 Évitez d’explorer vous-même l’itinéraire et optez pour ce circuit de 5 jours en tigre de Ranthambhore qui suit le cercle d’or avec des arrêts à Agra, Jaipur, Delhi et Bharatpur. De plus, il comprend également une balade en pousse-pousse dans le parc national Keoladeo Ghana, un safari en jeep dans le parc national Ranthambhore, tous les transports et quatre nuits d'hébergement 5 étoiles. This trip was to check the Taj Mahal off my list of "Wonders of the World." But I found that India has so much more to offer! I booked this through Viator.com. They did a great job in choosing PCTI. The trip was well coordinated and followed the itinerary almost exactly. By choosing the tour that included Ranthambore Tiger Reserve, I added an exciting experience seeing a tiger in the wild! The many other sites including the Hawa Mahal, the Amber Fort in Jaipur, the Lotus Temple, Humayun's Tomb, the bird sanctuary outside Agra - my goodness! There was so much to do and see. I opted for a solo tour, so I had my own driver (Thank you, KK Sharma) to pick me up on time or early at each of the excellent five-star hotels that I stayed in. Being in a private car, I was dropped off at the entrances of sites and was never kept waiting when I exited. Mr. Sharma navigated the insane traffic expertly and calmly. Plus he pointed out things on the way that I would have missed: the brick factories near Delhi, statues and temples on the roadside to Shiva and the Monkey God. Each day I had a different guide from the city I was visiting. I did not experience the daily life in India or walk the streets of Delhi. But I'm sure if I had wanted to, my guide would have made that happen. As it was, they kept me safe while showing me the sights and telling me the amazing history of this area of the world. Great job especially to Ahsoor (?) in Jaipur while riding an elephant and Mahesh in Agra. They had special tricks to share on best places for photos and were very knowledgeable in more than just dates in history. There is a good bit of driving to see all three of these cities. Consider this when booking your tour. I was quite comfortable riding in a late model Toyota Etios. The experience was one I would not have missed. Since the entrance fees of monuments and parks was included, all I had to buy was some of my meals. A very stress-free trip. My son and I wanted to travel to India to see the Taj Mahal, but we decided to add on additional days to see more of the country. This was a PERFECT tour. We were in several locations and experienced the culture, people, architecture, history, etc. The driver was THE BEST. The guides were informative and most of them spoke English clearly. We did this Tour two weeks ago, June 2018. It was very well organized and Shakul from Pacific classic tours did a wonderful job keeping us informed about our travel plans. The guides for the trip were good but Ashok was excellent, knowledgeable and made our visits to the monuments very entertaining. Vasudev and Mahesh our other guides were good and knowledgeable. Our driver Vipin Sharma was excellent. He accompanied us for all five days and was extremely professional and courteous. We had a wonderful trip and would highly recommend this tour and the company Pacific classic tours. This was a very fast paced tour - you cram a LOT into just a few days. It was great for what we wanted, and all of the guides were very knowledgeable. KK was a fantastic driver who pointed out things on the way, stopped when we asked, and was always on time. On this tour, you get all the highlights of the Golden Triangle in a condensed period. I would definitely recommend! This tour is hectic but incredible! We landed three hours before the scheduled pick up time, so they changed it to suit us and we started our tour two hours early. We had a safe, skilled and friendly driver for the whole five days and he was amazing! We spent the morning sightseeing in Delhi with tour guide number one, we also stopped at a carpet makers/fabric shop which was fine but we were followed around being pressured to buy something. We had a good lunch extra before the long drive to Jaipur. Our hotel in Jaipur was spectacular! After breakfast included, we met our second guide, Asook, who was thoroughly entertaining and knowledgeable. We decided to get to Amber Fort by elephant extra and Asook took some wonderful photos for us. He showed us all the key sites in Jaipur and took us to a great restaurant for lunch extra. Again we stopped at a carpet makers/fabric shop but felt less pressured here to buy something. We did end up buying some cushion covers, but later discovered they were double the price of other shops. We had another drive to the tiger reserve, where we had dinner on arrival included. We were asked to be downstairs at 5:45am to begin our tiger tour, but they didnt arrive until 6:40am. We didnt see any tigers in the morning, so had breakfast included and a good rest before lunch included and the afternoon tour. Again there was confusion with the timings, we were told 3pm, they turned up at 2:30pm. We saw two tigers on this tour! I have no idea how the driver or the guide spotted them but they were magnificent to see. We had dinner included when we got back. After breakfast included we began the longest drive 6 hours to Agra. One of the group was really ill and the driver made plenty of stops, including a stop for lunch extra. We went to the bird sanctuary, which was about an hour from Agra and saw a range of birds and mammals there. We were met by our tour guide, for the following day, at the hotel in Agra who explained the arrangements for the Taj Mahal. We had dinner extra in the hotel. We were out at 5:30am to visit the Taj Mahal at sunrise. You do not actually see the sunrise as you are looking at the Taj Mahal but the building is meant to change colours. We spent about two hours here before heading back to the hotel for breakfast included. We were taken to a marble makers and then to the Agra Fort. Here we were told we had no time for shopping, which we were disappointed by. We were dropped at the airport four hours prior to our flight. Youll need cash for tips. The scheduled stops along the drive include toilets, souvenirs and food. You have to pay to use the toilets at the bird sanctuary. All other toilets you have to pay to get tissue. We took our own. This was a very busy trip and we spent a lot of time in the car, however I would highly recommend it if you dont have a lot of time to explore the Golden Triangle. Very nice 5-Day tour to see the best of Rajasthan Agra Taj Mahal. Our driver K.K. Sharma was exceptional. Super safe and very professional. It was indeed essential to do 2 safari game drives in Ranthambhore to be able to see some tigers. We've been very lucky to see 2 of them on the morning safari less than 20 meters from our jeep. The Amber Fort close to Jaipur is a masterpiece, I highly recommend to go up by elephant not included, unforgettable experience. Excellent organization, congratulation to your indian travel agency partner, driver was always in time. Very good choice of places of interests. Highly recommended. The hotels were excellent, particularly the Tigress Resort and Spa in Ranthanbhore and the Jaypee in Agra. The service, food and accommodations were exceptional. We were met on time by our driver for the tour, Vipin Sharma, who picked us up at 3:00 a.m. at the airport and transported us everywhere we went until he took us back to the airport at the end of our tour. Which is good considering driving in India is not for the faint of heart! He was very pleasant, always on time, a careful driver, and very knowledgeable about India, filling us in on info we normally wouldn't get. We plan to request him as our driver when we make a return trip. All of our guides were very knowledgeable and knew where the best pictures and activities would be: In Delhi, Geet in Jaipur, Surya in Agra, Subhash. We especially enjoyed the Amber Fort, City Palace, and the Taj Mahal. Our safari was great. Be sure to dress warm for the morning safari and bring a good camera and/or binoculars there's a lot of wonderful wildlife. Special shops we enjoyed were the Art Palace in Delhi where you can buy Indian-made rugs and the Agra Marble Emporium, where the owner was very personable and accommodating. It is a very fast tour 5 days, and this worked well for us. If you are wanting to have more down time, you may want to schedule a longer tour.